The Bluejay is one of the most colorful birds to nest in our backyards and to visit our feeders. Considered by some to be a bully at the bird feeder, most of us birdwatchers welcome this blue and white bird to our yards. Placing peanuts on a platform feeder for them to eat is a sure fire way of attracting this bird for close up viewing. These birds are medium-sized ranging in length from 9 to 12 inches. Their crown and crest are gray-blue. The wing and tail feathers are bright blue with white and black bands. Look for this birds narrow necklace of black feathers across the throat and around the head. The upper parts are bluish gray and brightest on the rump. An interesting habit of the Bluejay is to imitate the sound of a Red-shouldered hawk. They'll often do this call to scare other songbirds from feeders just as they come flying in to feed. The lower breast, belly, and vent area are off-white. The bill, legs, feet, and eyes, are black. These birds have the ability to raise and lower their crest. 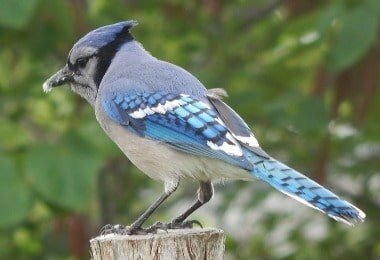 The diet of the Bluejay consist of a variety of foods. 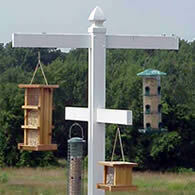 These birds are intelligent and adaptable, they are quick to eat peanuts at bird feeders. Be sure to use a Peanut Feeder that can keep the squirrels from getting the peanuts. Their winter diet consist mostly of vegetable matter, acorns, beechnuts, seeds and berries. Othertimes they will feed on larger insects, grasshoppers, caterpillars, mice, bird eggs, and baby birds. Although known to rob nest of eggs and baby birds, only a very small percentage of their diet comes from these sources. 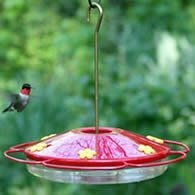 Typically, these birds are vegetarians and can be attracted to bird feeders with black-oil sunflower seed or peanuts to eat. When feeding birds I like to offer food types that are preferred by each individual species. They seem to prefer peanuts and are more likely to eat them than fighting for a single seed from the sunflower feeders. 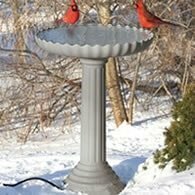 I place peanuts (with shell) on a platform feeder to keep these birds happy and to make it easier for the smaller birds to feed from hanging feeders at the same time. Watch them to see as they hold the nuts with their feet and then crack the shell with their bill. Often they'll cache their food. I was watching one day as the bird came for one peanut after another from the feeder in the backyard just to hide them in my front lawn. I have to admit I stopped feeding peanuts for a few days and started placing fewer in the feeder when I started feeding again. I didn't want five pounds of peanuts in my lawn. Beginning in early May, the courtship habits of the this bird begins. Generally a group of seven or more are gathered together in the top of a tree. One female is among this group. When the female flies off, the males will follow and land near her. Bobbing their heads up and down and displaying for her. The female will eventually select a mate from this group and the nesting cycle will follow. The nest is a bulky cup made of twigs, leaves, roots, grass, moss and sometimes held together by mud. Usually placed between 8 to 30 feet above ground. 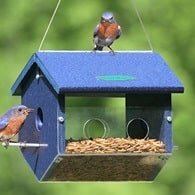 You can try attracting these birds to nest in your backyard by placing a nesting shelf in a tree, or on the side of a garage or shed overlooking both open spaces and foliage. Place the nesting shelf 10 to 12 feet above ground. Choose a location that provides protection from predators, elements, access, visibility, and varying sunlight. The female lays 3 to 7 greenish buff, blue, or yellow eggs with brown or grey spots. Incubation last 17 to 18 days and is done primarily by the female although the male sometimes helps. The young will leave the nest in about 17 to 21 days after hatching. Both parents share in feeding the young birds. 1 - 2 broods raised each season. After the nesting season in late summer and early fall these birds will travel in small flocks and family groups. Although only partially migratory (mainly a permanent resident) sometimes flocks numbering over 100 can be spotted moving south. Bluejays are extremely territorial, often diving at cats, dogs, even humans, who get near nesting and feeding territories. They may be loud and fly close enough to cause you to worry but don't. If they were to run into you it would be an accident. They will turn away. The best thing is to try and stay out of the area for a few days if possible. Otherwise just limit the time you spend near their nest site or their young. Mainly found east of the Rocky Mountains, these birds have been declining in numbers, due in part from the reductions in forest and woodlands. Specifically oak trees, which provide the acorns Blue Jays prefer to eat. 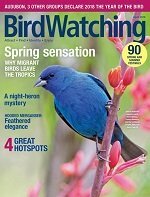 So do what you can to help this bird thrive by providing food and water all year long. It's a little thing but it can make a big difference.